Back to Austrian Stamps homepage Back to "WWI Field & Civil post interchange"
Commonly-met expressions such as "A k.u.k. Postmaster in full-dress uniform" or "The opening of the k.u.k. Post office" are wrong: the "u." is superfluous. However "k.u.k. Feldpost" is right! The following explanation may assist. K.u.K. stands for "Kaiserlich und Königlich", ie "Imperial and Royal". The authorities responsible for common affairs acted "imperially and royally". All agencies of the Foreign and the War Ministries thus carried the abbreviation "k.u.k. ", whereby the first k stood for the Kaiser (Emperor) of Austria, the second for the King of Hungary. K. k. stands for "Kaiserlich-Königlich", ie "Imperial-Royal". The autonomous authorities and offices of Austria acted "imperially-royally" as there were also kingdoms in Cisleithanien, for example Bohemia. They received the addition "Imperial-royal". The expression "Kingdoms and countries represented in the Reichsrat" was for a long time the only official definition of Austria! They were "k. k." up to the breakdown of the Dual Monarchy in 1918. K. or Kgl. are the abbreviations used in German-language texts for "Hungarian-royal". In the Hungarian language it became "magyar kiraly" generally shortened to "mag.kir." or "m.kir." Inevitably, after the Separation (Ausgleich) of 1867 there was a doubling of the state organisation for separated affairs. So for instance both Vienna and Budapest had a Department of Trade. The Austrian set "k. k." before the designation of his agencies, the Hungarian if writing in German the abbreviation "kgl.". And as the Department of Trade was responsible for the postal system, this too was divided; Austria had the k.k. Postal administration and Hungary the kgl. Postal administration. There was never a "k.u.k. Postal administration"! The same applies to all post- and telegraph- offices, coaches, mailboxes, telephones, uniforms etc; and for the Civil Service Grades of the staff. Perhaps the most philatelically famous and important occurrence of the K.K. vs. K.u.K. 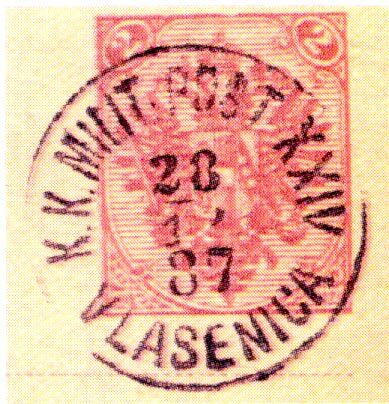 controversy occurs in the postmarks of Bosnia & Herzegovina. After the initial Feldpost and Etappenpost cancellers, the postmarks issued were all inscribed K.K. MILIT. POST [number] / [location]. The Hungarians were very much involved, and the War Ministry was ‘joint’, and Bosnia was effectively held by Hungarian troops. The Hungarians thus objected strongly to the K.k. versions and the postmarks had to be re-issued in K.u.K. MILIT. POST versions; this was done from 1 Jan 1890. "Fieldpost is different": In the event of mobilization or war, the "k.u.k. Feldpost" swung into action. The army was k.u.k., so likewise the field post offices, the communication lines behind them, telegraphy, the entire vehicle fleet etc. This is simply because the Fieldpost was responsible to the War Ministry acting for both Austria and Hungary, and it directly to the Emperor-King. In postal history books one finds also "k.k. Feldpost" and "kgl. Feldpost". 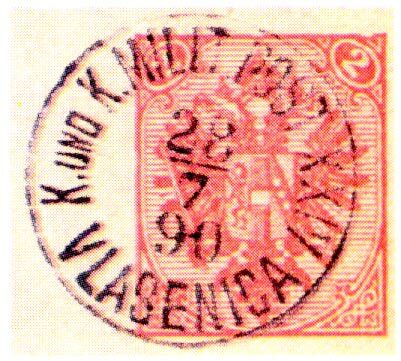 Austria and Hungary had peacetime military organisations, which maintained Fieldpost installations - the Austrian were "k. k." the Hungarian "kgl." (expressed in German). When war broke out, the "k.u.k. Feldpost" took over. BIG K or little k? The question has arisen, should Kaiserlich and Königlich be written in German with leading capital letters? (I would then do the same when using them in English, as I’d be quoting a piece of German.) There are many sources one could consult – they give conflicting answers! Hammer’s German Grammar says in the chapter on spelling that "adjectives forming part of names referring to something unique have an initial capital" (eg Franz Josef der Erste); and "adjectives formed from proper names with the suffix (i)sch have a capital when they refer directly to the person concerned, but a small letter if in the manner of" (eg das Elizabethanische England but das elizabethanische Drama: England during the reign of Elizabeth I but plays written in her reign or in that style though not by her). A short leaflet "Duden: Die neue Rechtschreibung" suggests that the ‘millennium spelling reforms’ have not changed matters – and anyway, as I am not composing new German but quoting old it wouldn’t matter if the rules had changed. Some native-german-speakers have suggested that "Kaiserlich-Königlich" is a "set phrase" so need not follow the Rules of Grammar. Analysis of a few texts suggests that it has not set well! Kropf (in "Die Abstempelungen der Marken von Österr.-Ungarn u. Lombardy/Venetia") appears on a quick check to consistently use "k.k." - small "k"s, no "u", two full-stops - unless he is directly quoting other usage, such as the inscription on the 1850 stamps ("KKPOST-STEMPEL"). An apparent exception is in the introduction when he talks about government ministries and the distinction between the ones with central powers over both Austria and Hungary (K.u.K.) and the others (K.K.). Perhaps this is how the ministries styled themselves, and he is quoting that. Koczynski (in "The History of Austrian Revenue Stamps", a work renowned for its pedantry) is curiously inconsistent. "Kaiserlichen Akademie der Wissenschaften" and "königlich ungarischen Whatever" are always thus. However in total he has 27 Kaiserlich and 21 kaiserlich, with no obvious reason for preferring one to the other. The phrase "Kaiserliche königliche" occurs twice only, written thus, both followed by "Stempelmarken" and referring to the legend on the stamps themselves - which is engraved in block capitals anyway! What is used in some typical Decrees as officially printed in the Reichgesetzblatt? The Newspaper Control Stamp was announced in the "Verordnungsblatt für Posten, Eisenbahnbetrieb und Telegraphen" for 1850, page 313, 31 Dec 1849. "Nach der Eröffnung des k.k. Finanzministeriums von 30. Dezember 1849 sind die in den deutschen Bundestaaten erscheinden politischen Zeitungen, welche durch die k.k. Postanstalten versendet werden …Die k.k. Oberpostverwaltungen werden demnach…". The Verordnungsblatt of 27 Feb 1853 introducing the 2Kr newspaper tax adhesive, paras 1-3: "… in welcher Bezeihung den k.k. Postämtern Folgendes bedeutet wird / Die Stämpelmarken enthalten den k.k. Adler, und die Umschrift ‘kais. königl. Zeitungsstämpel 2 Kreuzer. / Die Marken sind von den k.k. Postämtern…". Despite which, the actual stamps are engraved "Kais. Kön. Zeitungs-Stämpel. 2 Kreuzer."!! 1 July 1872, Verordnung on Railways, preamble: "Der königlich ungarische Communicationsminister…"
22 Dec 1880; announcement of renumbering of all postal forms: "PostVerordnungsblatt für das Verwaltungsgebiet des k.k. Handels-Ministeriums No 77 … hat das k.k. Handels-Ministerium eine Revision dieser Drucksorten veranlaßt." 1891 law creating a tax-free zone in Triest: "die Befreiung von der mit dem kaiserlichen Patente vom 29.October 1949…"
1892 law on taxing transactions: "…der k.k. Staatsverwaltung…"
1893 law on Sugar Tax in Bosnia: "… betreffend die Beschreibung und Zeichnung der k.k. österreichischsn und königlich ungarischen amtlichen Zuckerverschlußmarken … in dem Markenbilde anstatt des k.k. Adlers…"
24 Sept 1914, introduction of War Charity stamps: "Verordnung des k.k. Handelsministeriums" – and next in the same document the banning of the newspaper Slovenski Narod "Hievon werden die k.k. Postämter…"
1916 Postordnung, first column: "Die Ein- und Auszahlungen im Spar- und Scheckverkehr des k.k. Postsparkassenamtes …"
Pretty definitely, in the Laws Of Austria it’s lower case k! An APS member's extensive collection includes a box containing covers addressed in German from and to military offices during WWI. Not personal cards, but official covers. They are mostly all handwritten, a few typed, but none preprinted. Of these, 92 are addressed to an office with some form of "kk" in the address, typically "an das kk/kuk Whatever". Here is the raw data for these 92 covers. No distinction is made on whether or not there were periods. The u may be abbreviated or written out as "und". So this is what people actually did: Despite the fact that the military was supposed to be kuk, about a third used no "u". All together, fewer than 25% had SOME capital "k", most had none. But at the beginning of a new line, more had the capital than not.